Composting is perhaps the most perfect example of recycling because it is an entirely natural process which results in the creation of soil. It works by the decomposition of organic materials – raw food scraps, cardboard, grass clippings etc, which are broken down by micro-organisms that occur naturally. It is a convenient and inexpensive process, which helps the environment by preventing waste going to landfill and saves the energy of waste disposal and collection. It is estimated that around 40 % of the average UK household's waste is food scraps – if this was composted by every household in the UK, either by each household or in a community composting scheme, then imagine how much waste would be saved annually from landfill! Basically, all that is needed for composting is a small patch of land and a compost bin. The land needs to be soil rather than on concrete, as worms and organisms need direct contact with the soil. Those without access to a suitable piece of land could consider building or buying a wormery, which will do the same function, but solely by worms within an enclosed container. External compost bins can be either of the black plastic kind, which are available at most garden centres, or at a reduced price through many local Council recycling schemes, or homemade, wooden varieties. A compost bin of 4 sides (3 fixed walls, and 1 open side) can be easily constructed using 2 builders pallets – the sort used to transport bricks or other heavy materials. If you have a community allotment area near you, do check out the various styles of compost bins built there. Most gardeners are passionate about compost, and will happily give advice. A piece of old carpet is ideal to cover the compost. The best way to build your compost pile is to add ingredients to it in layers. A good pile will consist of a blend of materials that contain organic matter, i.e vegetable scraps (about 80% of the total), carbon, nitrogen, phosphate and potash. Grass cuttings, woody material (prunings, pencil sharpenings), coffee grounds, tea leaves or bags, vacuum bag contents, egg shells, newspapers (shredded), cardboard (ideally wet), leaves, sawdust, pine cones, dead flowers, old plants, hay & straw, lint from the clothes dryer, and pet and human hair are all ideal for the compost pile. Urea and seaweed are excellent activators to add to the pile at any time. Never put meat (raw or cooked), fish scraps, cooking oil or any cooked food scraps in the pile as these will attract vermin such as rats. Dairy products, cat litter (including pet faeces, which could contain disease organisms), and barbecue or coal ashes, which contain harmful sulphur oxides, should never be added to a compost pile. 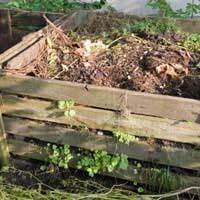 The key to keeping a compost pile fermenting and decomposing is never letting it get too wet or too dry, and by turning it regularly with a fork. If on the rare occasion the compost smells, this is usually caused by an excess of nitrogen-rich material, such as grass. Put more woody material or paper and cardboard in to counteract this. It is impossible to say how long it will take for every compost pile to throughly decompose, and produce fine black soil. A general estimate is between 3 to 6 months, but it could be up to a year depending on its composition and external factors such as heat. Adding garden worms, or buying some worms from a fishing shop may speed the process up, but worms are just one of the processes that are in the mix churning it all up. The best thing is to sit back, perhaps divide the pile into two if homemade (or buy a second plastic bin), and cover one pile, allowing that to decompose without adding any fresh material to it, and start a second pile. Talk to some gardeners, experiment with your own compost, anticipate using the end result – the soil can be used anywhere in your garden or with houseplants, and feel good that you are recycling waste that would have otherwise been dumped into landfill. You are saving and nourishing the environment! If you're going to put worms in the compost you're really much better off building a worm bin, which really uses the worms to their full capacity. There are plenty of instructions around, and you'd do best with special types of worms rather than something from the tackle shop. They're very easy to maintain and produce compose quickly and of extremely high quality - and the worms will digest many things, so you're really recycling.